Finally I'm ready to show acquired data on the web. I developed a small PHP web application which shows data and charts through the browser. The User Interface is very simple; it aims to let me verify that all the systems are running fine. From the first chart you can see a strange thing...during the night it seems that photovoltaic production is positive...(impossible, isn't it?). It is due to the reactive power caused by capacitors in the inverter. Under every chart you can also see the last detected data. On this page there is an auto refresh function which lets you see the real time data. Then I also developed a login page for future functionalities. This web application is running on the Raspberry PI, where Apache 2 is installed. I used a Dynamic DNS service to let this web application be on internet, through a NAT managed by my home router. I used NO-IP service, which gives me 3 free domains. There is also a linux client application which keeps DNS updated every time my public IP will change. Another kind of data I would like to acquire is the production of my photovoltaic plant, a 3 kwp plant built over my roof and made by SUNAGE 250 swiss modules and AROS SIRIO inverter. 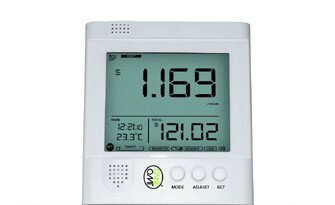 I also received a little energy monitor tool, which allows me to verify power production through a wireless display. This display is able to store data in a little sqlite database. Through a USB connection, it lets me view and download data using a PC. My model is the OWL+USB CM160. I compiled and installed this software directly into the Raspberry. It is a background process which detects the CM160 e gets the database data. This is the shell of Raspberry where you can see the eagle-owl software and database files. This process will run automatically on startup. Then I wrote a little php script which is able to read CM160 database file e put its data into mysql. In this way I could store all historical data which will be displayed through a web interface. This script will run on Raspberry every minute (standard cron task).